“McQueen” is a documentary film about the rags-to-riches story of Alexander McQueen, a successful fashion designer, who has turned fashion shows into visual art experiences for the viewers. The film takes a look at his road to success. The main message conveyed by the creators of “McQueen” is that this English fashion designer was the brightest enfant prodige of the industry. Though it could be undermined by some zealous lovers of the fashion world, a laic will simply accept this truth. The notion about McQueen being the mind, which has set the course for hundreds to come, is visible in the structure of the film by Ian Bonhôte and Peter Ettedgui. The story quickly jumps into presenting McQueen’s interest in clothes. Without much ado and McQueen’s youth being barely discussed, the documentary focuses on the moment when he already started developing as a designer. Even when we get to hear bits about his childhood, they remain rather loose facts, mentioned to sketch a bit of background. 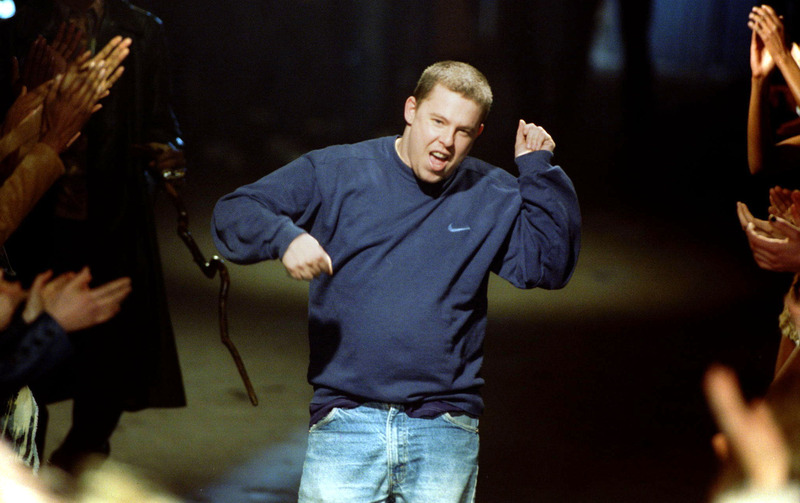 Such approach allows the creators to delve into the more abstract aspects of McQueen’s rags-to-riches story. It’s a homage to a man of art, a person, whose clothes landed far beyond the lines of comfort and regularity. Even the choice of people, who add pieces to the story, is a proof of that. Among those, who share their views, are mostly people fascinated by McQueen – his employees, co-workers and friends. From the viewer’s point of view, you might feel a bit “propaganda-ed”. It’s a fault of “McQueen”, which deepens as the story unfolds. Even when people mention criticism of Lee (that’s how he’s often referred to in the archive footage), we never actually hear the side, which didn’t see his sheer brilliance, but rather felt flabbergasted or even uncomfortable with his creations. I understand, that nobody would like to hear rants about the man, who changed the whole generations in the industry. However, the moments we hear even the mildest criticism are quickly followed by another astonishing show and success. There is little space to gather thoughts and form your own opinion. While most documentaries are safe in execution, barely challenging the cinematographers, the crew which worked on “McQueen” deserves a standing ovation. The film is divided into several chapters, with each one of them preceded by a 3D animated skull, ornamented or changed accordingly to the topic of this part of the story. There is also a portion of archive footage, traditional interview perspective and tons of other flashy effects, which all together blend into an exhilarating visual layer. Such a visual galore is a beautiful tribute to Alexander McQueen’s shows. The recordings of his most profound catwalk galleries prove that his love for fashion was vastly inspired by the art of theatre. The creations were often impossible to wear, but they were imbued with a stunning amount of creativity. McQueen’s fashion was dark, artistic. It was closer to Gothic sculptures, baroque paintings and Breughel’s love for ugliness, rather than the regular sense of the word fashion. While we’re at the darker part of the story, “McQueen” has also depicted the downfall of the fashion mastermind. The story smoothly captures the isolation of the man, who was never quite ready for that baggage that came. But again, these less proud moments are given equally less attention. By the end of the film, you will not remember the fact he was a drug addict or a man, who didn’t really appreciate the work of his closest employees. Is “McQueen” a revolutionary documentary feature? Looking at its vivid visual style, it is. As a film, which depicts the life of an incredibly polarizing figure, it lacks a kind of balance, which marks only the most genuine masterpieces. It wouldn’t hurt his high-standard personality, but it would allow people to think independently about him. Even McQueen himself has emphasized how his work evokes emotions, relying on one’s experience. This film, even if it honors his career and legacy, doesn’t quite grasp that will do give people freedom of interpretation.